This is my dog. His name is baby. I don't know why we named him that. I guess someone thought it was funny at the time. Anyway, few weeks ago, Baby started limping around. I thought he'd cut his paw or something, but when it didn't seem to be getting better, I took him to the vet. 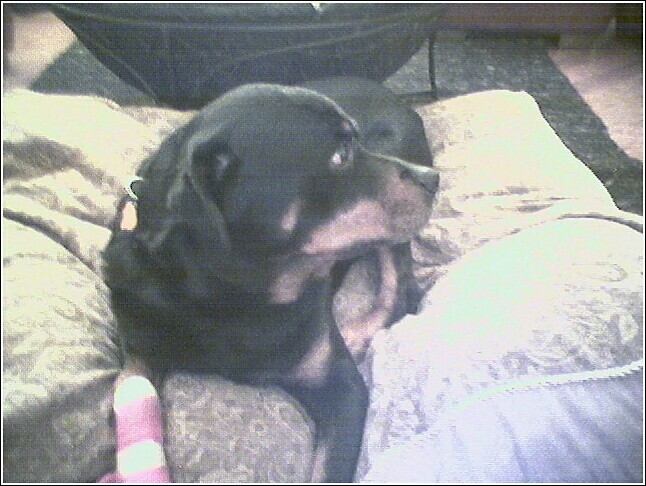 The nail bed was infected, so the vet cleaned it out, wrapped it up, and gave me a pain killer and some antibiotics. After a few days, it seemed to be all better. Then a week or so later, he started limping around again. I took him back to the vet, and this time he removed the claw and took a tissue sample to have it analyzed. A couple days later, he called and said that it was squamous cell carcinoma, which, apparently, is something that Rottweilers are prone to get. Assuming it's caught early enough, the treatment is to remove the digit. I took him in this morning for the operation along with x-rays and a needle biopsy of the lymph nodes to make sure the cancer hadn't spread. Unfortunately, the dog came home with all his toes intact. 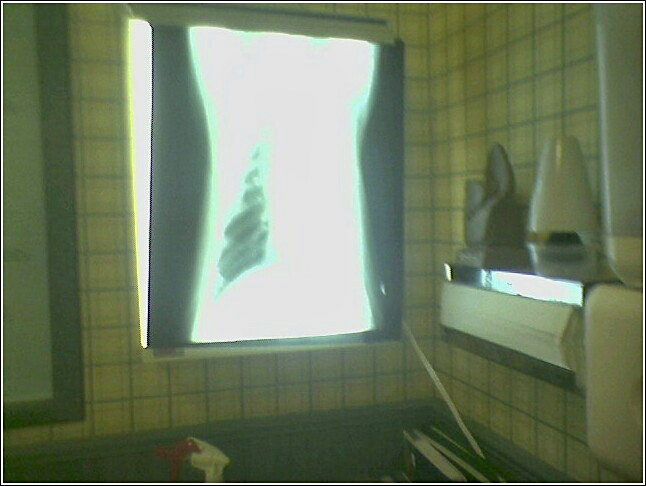 A healthy lung shows black on an x-ray (presumably because there's nothing in it but air). This is a low quality cell phone picture, but that's still pretty much what the x-ray looked like--one lung riddled with cancer. The vet said he's got maybe two months, maybe six months, and there's really nothing left to do but try to make him as comfortable as possible and treat the pain. I never wanted a dog. My ex- brought him home about seven years ago, and he stayed when she left. But apart from his annoying tendency to take himself for walks when I was too busy or too tired or whatever (which has resulted in a couple run-ins with the dog catcher), he's been a pretty darned good dog. I really had no idea how attached I'd become to him. I'm sure going to miss him. The house I live in was a fixer-upper when I bought it a bit over 10 years ago, and it seems like for every upper that's gotten fixed a couple downers cropped up to take its place. In particular, age, poor design, and bad plumbing have taken their toll on the kitchens and bathrooms, which are moving into the realm of the just plain disgusting. In the kitchen, cabinet hardware has deteriorated to the point where some of the cupboard doors have just fallen off, an unnoticed drip from a window air conditioner has rotted out a wall, and if the drains aren't regularly treated with lye, the washing machine backs up and drains onto the kitchen floor (and no, I don't know why they decided that the kitchen was a good place for the washer and dryer hookups). There are two bathrooms. One of them developed a hole in the floor at the edge of the bathtub, and it's been in the process of getting remodeled for about the last five years. Once the floor got replaced, the tile laid, and the toilet and tub connected, I sort of lost interest. In the other bathroom, the toilet developed a leak where the tank connects, so it's had the water turned off for a couple years. The drain on the sink recently developed a leak too, so it has a bucket under it. Strangest thing happened last night. I was watching the second episode on first disc of season two of the new Dr. Who, and it morphed into the Texas Chainsaw Massacre. Most of the way through the "New Earth" episode, Dr. Who got pixelated and it switched over to a completely different movie. So instead of finding out how the Doctor and Rose were going to get away from the septic zombies and what was going to happen with the Doctor and the Big Giant Head, I saw some guy get his legs cut off with a chainsaw. I can't believe they let that get by quality control. Don't they know children and people on acid watch that show? It's variously been described as "one of the most frightening pieces of recorded music ever" and "the worst hit song of all time." I understand that a lot of stations wouldn't play it because it was considered too controversial, but that never stopped WJIM. Anyway, all I know is that it was hugely popular among all the third graders I knew. Does anyone in New Orleans really talk like that? Because I've been there lots of time, and I've never heard it. Their judge and DA sounded like they were doing bad imitations of someone from My Cousin Vinny. Oh, what the hell. Louisiana..., Alabama..., what's the difference? It's all Deliverance country. Today's recipe is SpaPeggy and Meatballs! You might think it's just noodles and tomato sauce and balls of meat. But then you add just the right amount of sugar an grated parmigiana cheese. Thanks to Mrs. Peggy Hill for submitting this recipe. Believe it or not there really was a reason why I posted this post. And that reason is that the recipe for Spa-Peggy and Meatballs was nowhere to be found on Google. I was making spaghetti and meatballs this evening, and my son suggested that I kick it up a notch and make SpaPeggy. 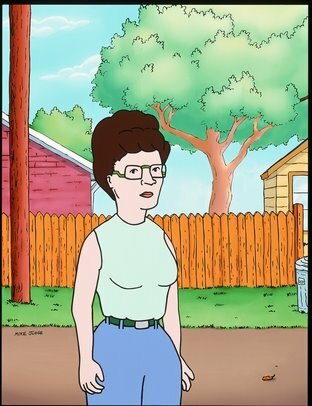 As anyone who watches King of the Hill knows, Spa-Peggy is what Peggy Hill calls spaghetti when she makes it with some insignificant changes (changes that don't really deviate from a lot of standard recipes). Anyway, I thought I'd make it with her insignificant variations, but I couldn't find the recipe online. I had to go back and watch "Peggy's Fan Fair" (season 4, episode 24) to get the recipe. I figured it was my civic duty to post this post so in the future when people want to make Spa-Peggy and Meatballs, they'll be able to find the recipe without having to figure out what episode it was on.